Clever, humorous and well-written detective mystery targeted for late elementary and middle school readers. I must admit the plot kept me guessing and entertained. Chapters are short and easy to read. Pencil sketches are an added bonus. I particularly enjoyed the way that the authors found a way to integrate those dreaded hard to solve math word problems right into the story line. As a bonus, the reader is presented with a few more problems to solve at the conclusion of the mystery. They can check their answers on the authors’ website. Felix, Gertie, Stanley and Charlotte are a bright group of sixth graders who become interested in forming a detective agency. Using Felix’s tree house as a base of operations, Felix attempts to find out who is stealing his food from the kitchen by using his binoculars. When Charlotte brings a police scanner up to the house, they hear about an armed robbery at the local jewelry store. The budding detectives rush to the scene. They discover the owner Mr. Franklin has been hit on the head and his most valuable possession, the Claymore diamond, has been stolen. Police apprehend a suspect quickly, and the case appears closed. Our four young detectives believe otherwise; they refuse to quit until what had appeared obvious is revealed as erroneous. Lots of twists and turns in the plot. The characters are believable and authentic middle grade students. 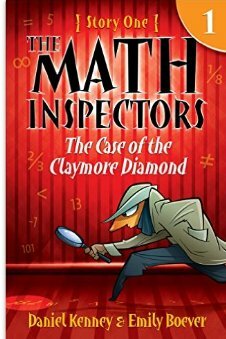 Readers will find themselves enjoying the math challenges that come along with the case. Great way to get students involved with math while reading. Look forward to reading new books in the series as they are released. These look brilliant! I will definitely be getting my 6th grader these. Thanks for the great post! This is one to keep in mind for the future. My daughter is 6 and she absolutely loves and is good at math. (Did not get that from me) This sounds like a great gift for her on a future birthday. Good that is is also a series! Never thought about that, but you are right about it being a good birthday gift. Ooh, these look so good! My 6th grader will eat them up! Thanks for linking up at Booknificent Thursday at Mommynificent.com! Most young readers will especially enjoy the tenacity of the characters.